Neil Percival Young (born November 12, 1945) is a Canadian musician. He is known for his country and rock songs. Sometimes, people call him the Godfather of Grunge because the style of some of his songs led to the kind of music called grunge music that started to be popular in the early 1990s. Many of his songs have a political and/or personal message. He was also a member of the groups Buffalo Springfield and Crosby, Stills, Nash & Young. Some of his best-known songs are "Heart of Gold", "Helpless", "After the Gold Rush", "Rockin' in the Free World", "Cinnamon Girl", "Southern Man" and "Like a Hurricane". Young has explored many different styles of music during his career, and not all his records have been popular. During the 1980s, he was sued by his record company, Geffen Records, who believed he was making records that would not sell very many copies on purpose. Young won out over Geffen in court. From 1978 until their divorce in 2014, he was married to singer-songwriter Pegi Young. They had two children. Young is known as an environmental and political activist and his views can sometimes be found in the lyrics of his songs. He is a long-time supporter of the family farmer. 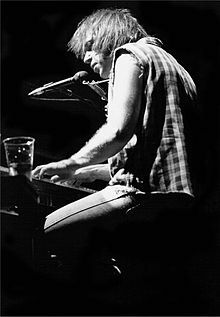 In 1985 Young, along with Willie Nelson and John Mellencamp, co-founded the benefit concert called Farm Aid which has continued every year to help raise money to keep farmers in business. He also did not support George W. Bush when he was the president of the United States, and even wrote a song called "Let's Impeach the President" about how he thought Bush should lose his powers. In the 1970s, Young released two songs (on his After The Gold Rush and Harvest albums) critical of racism in the Southern United States. These songs were called "Southern Man" and "Alabama". Lynyrd Skynyrd, a band from the Southern United States, made a song in response called "Sweet Home Alabama" that has become a very popular rock classic. Young's name is said in the lyrics of "Sweet Home Alabama". Neil Young has been inducted into the Rock and Roll Hall of Fame twice, first as a solo artist in 1995 and again as a member of Buffalo Springfield in 1997. ↑ "Lynyrd Skynyrd and Neil Young". thrasherswheat.org. Retrieved December 22, 2010. This page was last changed on 9 January 2019, at 10:52.